Lauren Fleshman isn’t your average jock. In fact, were real life like high school, we don't know where she’d sit at lunchtime. If you subscribe to Runner’s World, you've probably checked out her cover-worthy six-pack abs in November 2011 and have been reading her new column, The Fast Life. If you’re a track junkie, you’ve doubtless taken note of the 5K whiz’s impressive results at the NCAA, National, and World Championships. But she’s not just a speed demon on the track—Lauren Fleshman’s an entrepreneur, dedicated blogger, and serious businesswoman. I talked with Fleshman about how juggling a few careers (no biggie) has improved her running and changed her life. In 2010, after seven years as a professional runner, Fleshman hit a patch of bad luck. A foot surgery sidelined her for 18 months, and she felt alienated from her former training buddies during the long, solo road to recovery. Luckily she found a way to keep herself busy and stay connected with other runners. She broke out the laptop, tapped into her teacher brain (she has a master’s in education from Stanford), and launched Ask Lauren Fleshman, a site where readers can submit their running queries and get answers from the pro herself. In addition to the Q&A, the site includes Fleshman’s personal journal, in which she writes about her daily life, struggles, experiences, and latest ventures. Even after getting healthy and running in the 2012 Olympic Trials (she did not qualify for the London Games), Fleshman’s kept up the blog. Far from withdrawing into herself and her training as she’s gotten more successful, she’s made her life an open book. From her considerable struggles with injury to daily goings-on with her triathlete husband and new baby, the blog is a testament to a life that’s sometimes messy, often disorganized, and definitely doesn’t always go according to plan. Fleshman’s commitment to teaching and connecting with other athletes goes far beyond her blog. Off the track, she’s become involved in sports from head to toe (or rather, from mouth to feet) via protein-bar company Picky Bars and athletic outfitter Oiselle. In 2010 Fleshman, her triathlete husband Jesse Thomas, and pro marathoner Steph Rothstein launched Picky Bars, a line of gluten- and dairy-free protein bars. After making snacks at home to fit their own various allergies and nutritional needs, the crew put their bars on the market. Since the founders know that fueling up for multiple training sessions each day is no joke, Picky Bars are loaded with a nutritionally sound balance of protein, carbs, and fats for optimum performance. The trademark slogan—“It’s freaking science, dude”—sums this up pretty well. Originally published May 2013. Updated April 2014. 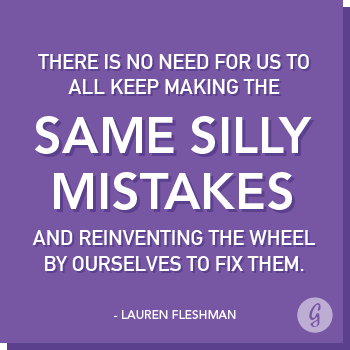 Keep up with Lauren at asklaurenfleshman.com or follow her on Twitter.